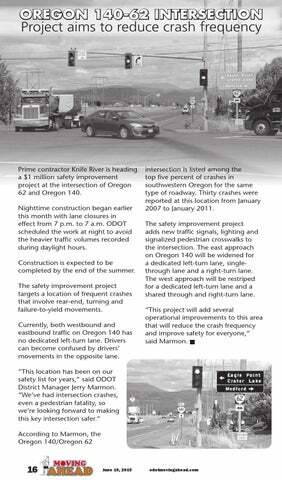 Prime contractor Knife River is heading a $1 million safety improvement project at the intersection of Oregon 62 and Oregon 140. Nighttime construction began earlier this month with lane closures in effect from 7 p.m. to 7 a.m. ODOT scheduled the work at night to avoid the heavier traffic volumes recorded during daylight hours. The safety improvement project targets a location of frequent crashes that involve rear-end, turning and failure-to-yield movements. Currently, both westbound and eastbound traffic on Oregon 140 has no dedicated left-turn lane. Drivers can become confused by drivers’ movements in the opposite lane. According to Marmon, the Oregon 140/Oregon 62 intersection is listed among the top five percent of crashes in southwestern Oregon for the same type of roadway. Thirty crashes were reported at this location from January 2007 to January 2011. The safety improvement project adds new traffic signals, lighting and signalized pedestrian crosswalks to the intersection. The east approach on Oregon 140 will be widened for a dedicated left-turn lane, single-through lane and a right-turn lane. The west approach will be restriped for a dedicated left-turn lane and a shared through and right-turn lane. “This project will add several operational improvements to this area that will reduce the crash frequency and improve safety for everyone,” said Marmon.